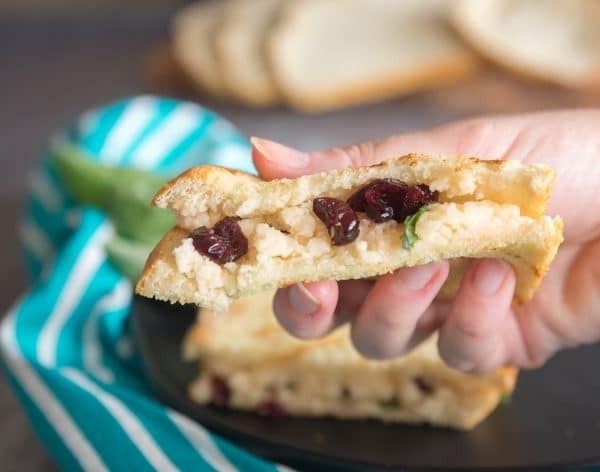 This cranberry grilled cheese is a festive twist on a classic crowd-pleaser. 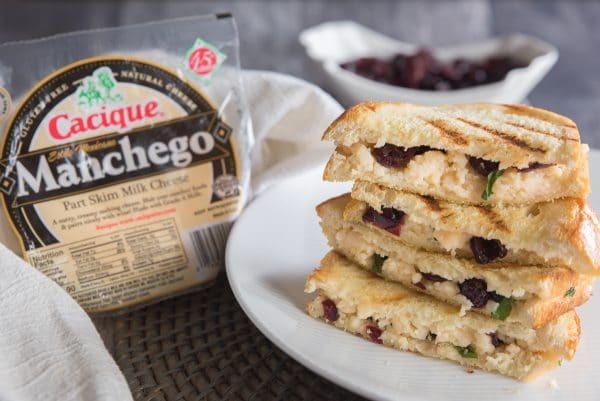 It’s packed with flavor from creamy manchego cheese, dried cranberries, and sourdough bread. Plus, it’s easy to make in under 15 minutes! Can you believe it’s December already? Besides all the holiday decorations, one of my favorite things about this time of year is the food. And one of my most loved seasonal ingredients is cranberries! Fresh cranberries. Dried cranberries. Even that canned stuff that only sort of resembles cranberries. I love it all. 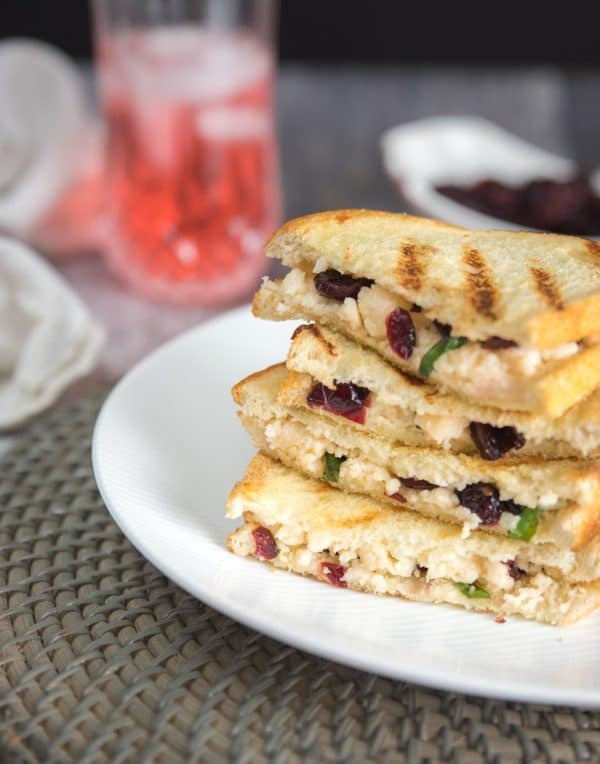 So when I went to create this delicious Manchego Grilled Cheese, I couldn’t help but give it a bit of a cranberry-inspired twist. This is the perfect recipe for those busy weeknights – when you’re scrambling to get dinner on the table. It’s quick and easy to pull together. It’s loaded with flavor. And it’s kid (and husband) friendly. Obviously the most important part of any grilled cheese sandwich is the cheese. And I am totally in love with this Cacique® Manchego Cheese. Manchego is one of my favorite varieties of cheese. 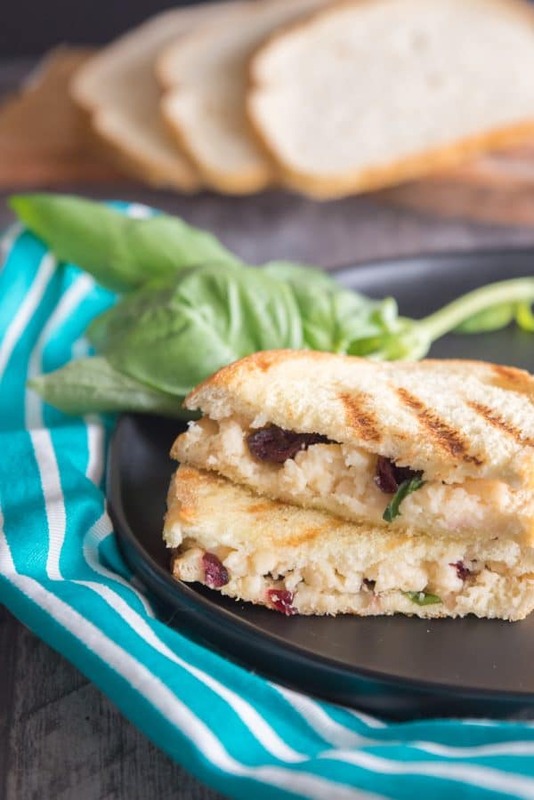 It has a great nutty, earthy flavor and a creamy texture that is just perfect for a fancy grilled cheese sandwich. 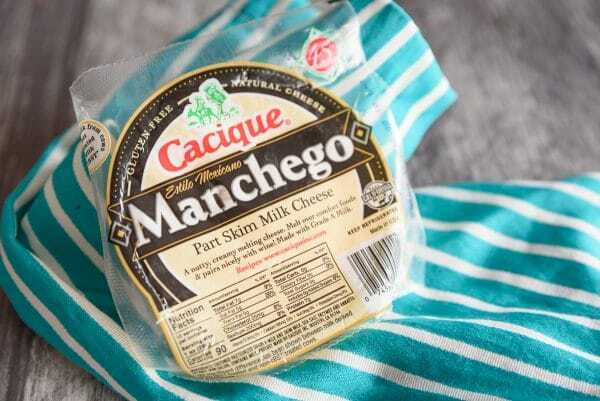 This Cacique® Manchego Cheese tasted so fresh and flavorful. It’s a great, simple way to add a bit of Mexican flavor to an otherwise ordinary dish, without having to spend a ton of time in the kitchen. This whole recipe took me just 15 minutes. 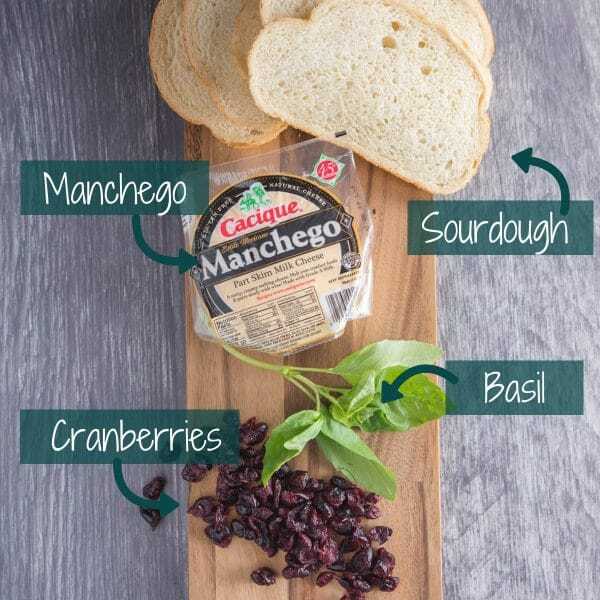 Cacique® makes a whole line of Mexican cheeses and sour creams, and now I can’t wait to experiment with all of them! You won’t believe how simple this grilled cheese is. 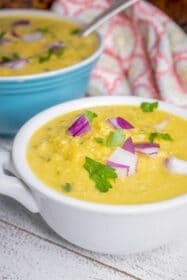 In fact, this is a great recipe to cook with the kids, for a bit of extra family time. Start off with your favorite bread – I used a fresh Sourdough Bread. 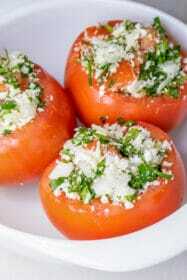 Then spray a light coating of olive oil spray on both sides of your bread slices. This will help keep the bread from sticking to your pan, and also give it a nice golden color as it cooks. 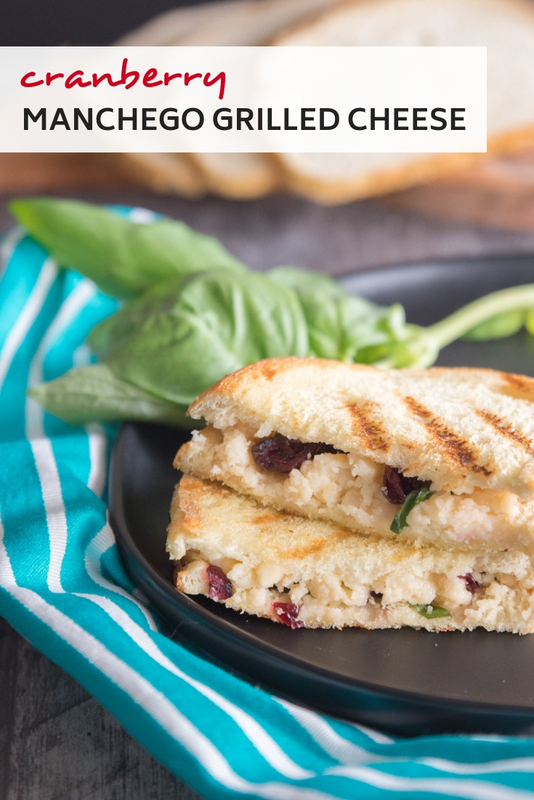 Then take one slice of bread and layer it with manchego cheese, dried cranberries, and thinly sliced basil. Top it with another slice of bread, and smush it down a bit, so everything starts to stick together. 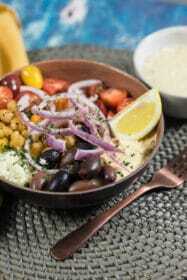 Then heat a grill pan (or a regular frying pan) over medium heat, and spray it with a little bit more olive oil spray. 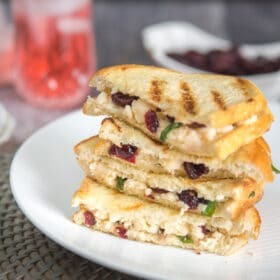 When the pan is hot, place your cranberry grilled cheese sandwich on it, and cook for 2-3 minutes. Use a spatula to check the underside of the sandwich every minute or so. When the underside is a nice golden color, flip the sandwich and cook for an additional 1-2 minutes. The second side will cook more quickly, because the pan is already hot, so keep an eye on it! When the cheese is melted and the bread is golden brown, remove the sandwich from the pan. Slice in half and serve. Enjoy! Spray both sides of the bread slices lightly with olive oil spray. Top one slice of bread with half of the manchego cheese. Sprinkle half of the dried cranberries and half of the basil over the manchego cheese. Top with a second slice of bread, and set aside. Repeat process for second sandwich. Heat a grill pan on the stovetop over medium heat. Spray lightly with olive oil spray. Place the two sandwiches on the grill pan, and cook for 2-3 minutes, until the underside of the sandwich is a light golden color. Flip sandwiches and cook for additional 1-2 minutes. Watch carefully, and remove when cheese is melted and sandwich is golden brown. Slice each sandwich in half, and serve.